The current state-of-the-art in municipal effluent treatment as well as in treating lower loaded organic industrial effluents is a biological wastewater treatment under aerobic conditions. Typically, aerated basins are used. The overflowing biomass is settled in a succeeding tank and most of the biomass is reintroduced into the aeration stage. Some sludge is removed as excess sludge. This is a very robust and effective treatment step of wastewater, provided that sufficient amounts of oxygen are supplied. And this is the drawback of the current technology: in order to achieve a sufficiently high oxygen level, huge amounts of air need to be mechanically dissolved in the water. Therefore, aeration is one of the major energy consumers of wastewater treatment plants. 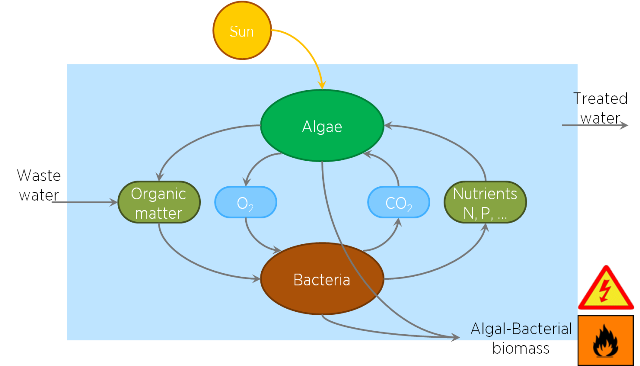 Combination of steps (1) and (2) leads to a net zero consumption/production of oxygen and carbon dioxide, yielding a novel ALBA process in which organic pollutants are directly converted to valuable algae biomass. Moreover, by including algae in the wastewater treatment, also other biodegradation pathways are available for persistent organic compounds such as steroid hormones or polyaromatic hydrocarbons, which are difficult to treat in current biological wastewater treatment schemes. Therefore, integration of algae and bacteria into a symbiotic system has a large potential for wastewater treatment.